January 24, three days after Bangkok declared a state of emergency, I was starting to rethink beginning our journey in Bangkok. Mass protests were spread throughout the city leading up to the February 2nd election. 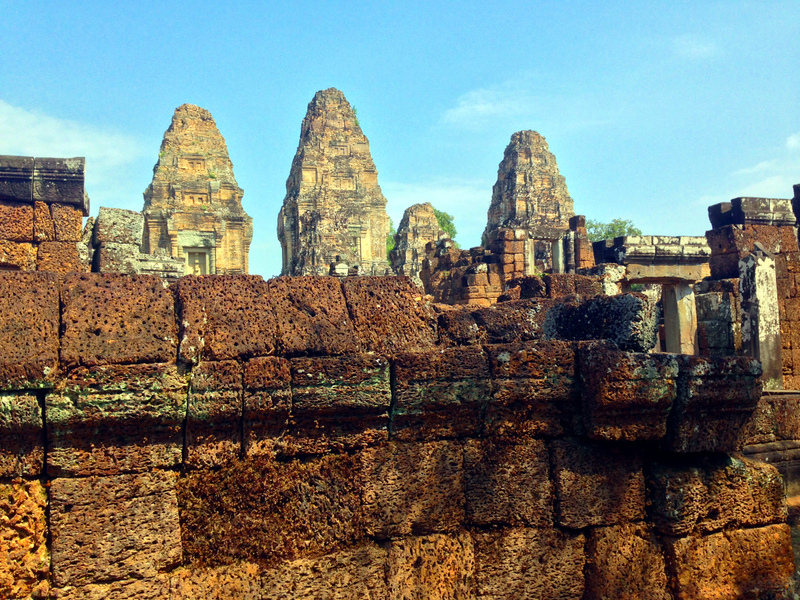 We planned to move through Southeast Asia counter-clockwise, starting with Cambodia, so why not fly directly into Siem Reap? 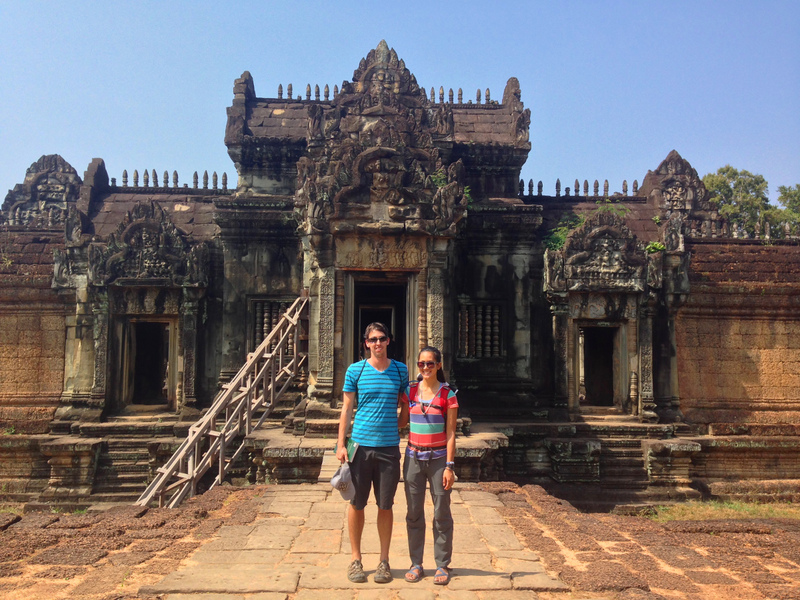 The day before departure, I changed both of our flights to land to Siem Reap (thanks, Dylan for being the voice of reason). My flight landed late Monday night, so we slept in the next morning before setting out to explore the city by foot. 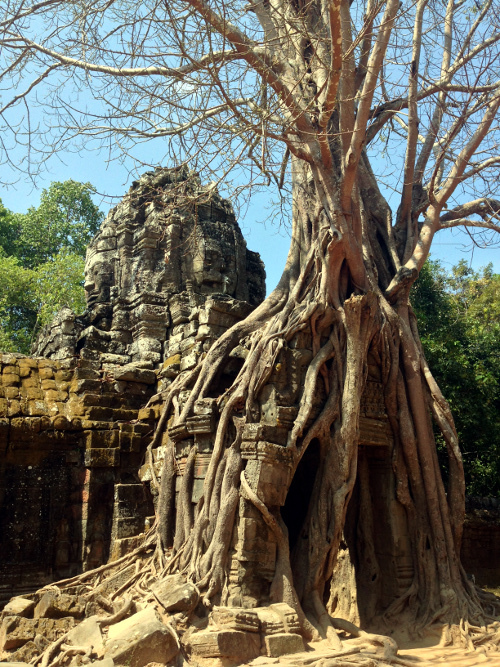 Siem Reap was a charming, small town with three distinct market areas – the American/European market (closest to our guesthouse), the Cambodian market, and the Chinese market. In the Cambodian market, I was pleasantly greeted by a colorful display of tropical fruit. Mangoes, longan, mangosteen, durian, jackfruit, and more were all available. The Madagascar plum is one of my favorite new discoveries – it reminds me of a persimmon almost. There were also lots of fried bugs to enjoy – crickets, silkworms, water beetles and even roaches. It took me a few days to work up the courage, but I did manage to eat a fried cricket. Not bad, but not that great either. (Disclaimer: I have eaten cricket before in Washington DC’s Oyamel in a chapulines taco which consists of sautéed grasshoppers, tequila, shallots, guac. Oyamel’s cricket taco is my least favorite dish, ever. The grasshoppers were not crispy and you actually had to chew. I could only take one bite and Matt was a champ to stomach the rest of that taco– read: take a bite and swallow with a swig of beer. I’d much rather eat a can of fried crickets before another bite of that taco.) I found out online that they also have fried tarantula – not sure I’ll ever be able to try that. There was great gold section of the Cambodian market where jewelry is sold by weight. We watched on as a man was melting gold in a crucible and poured it into a mold. All the gold sold is yellow gold, showing the traditional Asian preference for the yellow variety, whereas the American market only had white gold (though by touch, I doubt the gold sold at the American market’s authenticity – they felt like plastic). The American/European section was full of “fishy foot massages,” the ones where the fish nibble at the dead skin on your feet. No thanks, human hand massage instead, please. 50 cent beers and no open container laws make the streets of Siem Reap as good a party potential as NOLA. 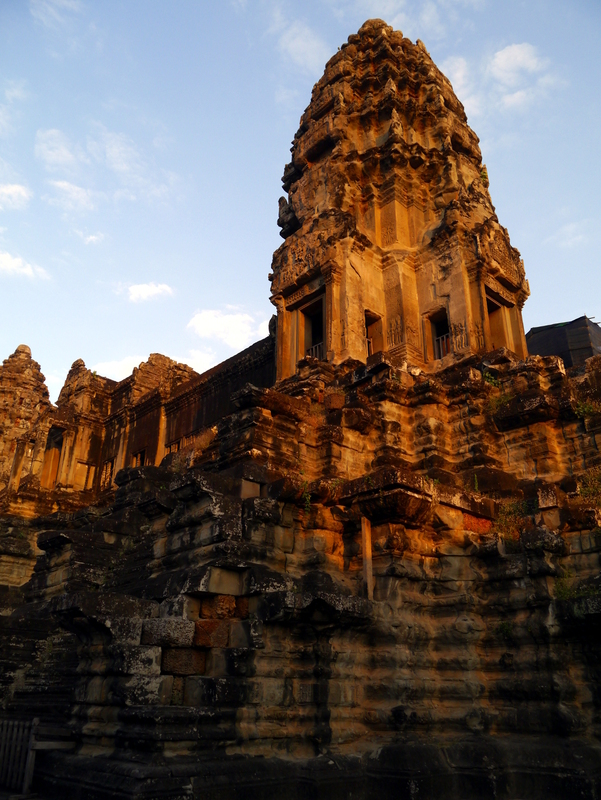 We stayed at the Angkor Wonder Hotel for four nights, and I would definitely recommend it as a great budget option, as the owner, Mr. Why Not, is incredibly helpful. He arranged for us to share a tuktuk with two girls, Theresa and Celine for our two day temple tour. The Angkor Archeological Park is humongous, over 400 sq kms, so we started the first day on the “Grand Tour,” which covers many temples on the outer perimeter. This was our first taste of temples, so I’m glad we started with the most famous. 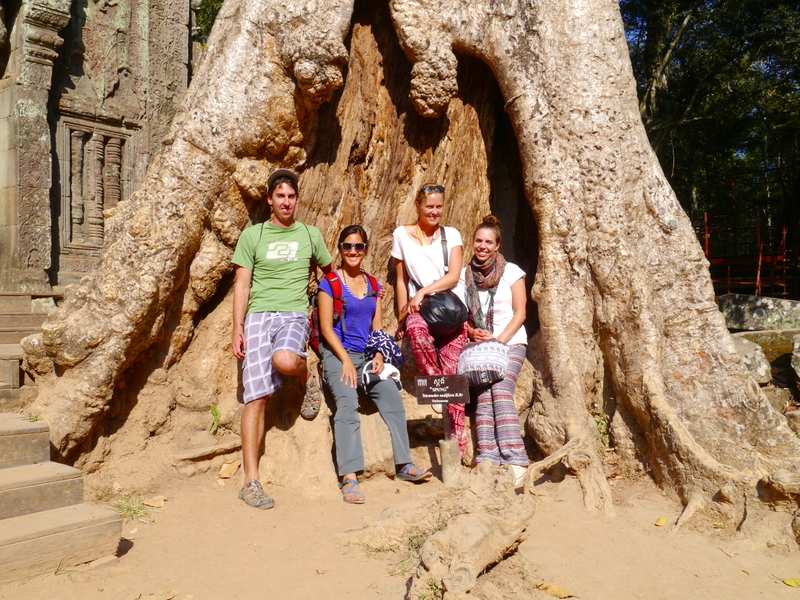 The four of us walked through each temple at our own leisure while being karted around by our amazing driver, Clem. The original plan was to watch the sunset the first day and sunrise the second, but immediately after lunch, Matt discovered that he had lost his ticket! The tickets are checked at every single temple entrance and along the road at checkpoints; I had never seen any park check tickets so diligently/constantly. There is a $100 penalty for not having a ticket, so sunset was a no-go. Celine and Theresa were awesome sports about it and agreed that we’d cut day 1 short and just have a mega-long day 2. We would be touring along the inner loop from sunrise to sunset. 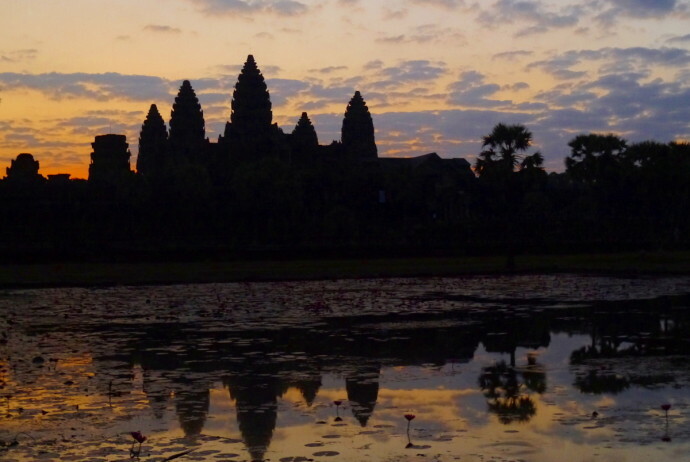 Clem was at the hotel at 5AM ready to leave so that we would be able to see sunrise over Angkor Wat. We drove in silence in the dark, Matt purchased another ticket, and we followed the hundreds of people through the entrance path to see the first glimpse of daybreak. 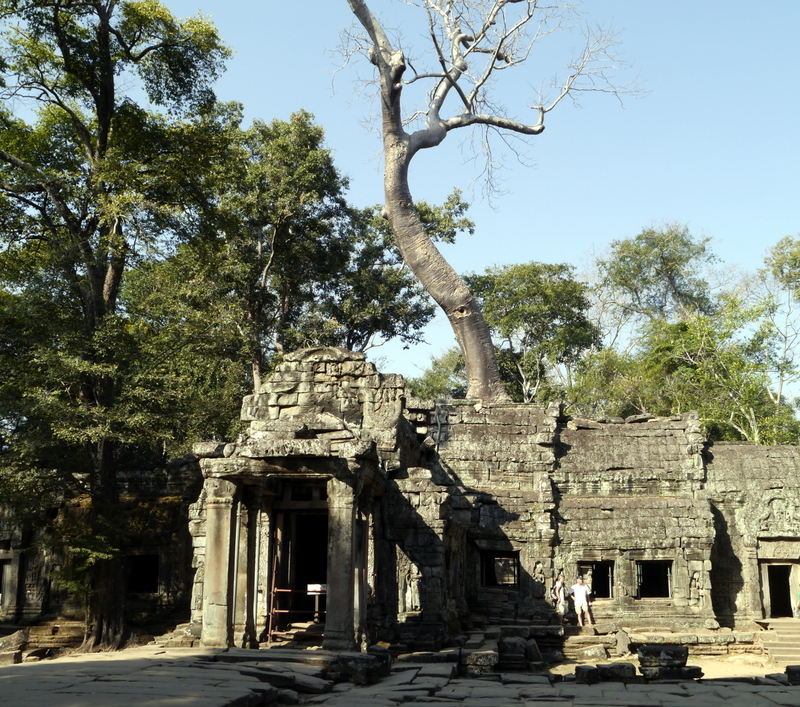 We had heard mixed reviews on sunrise at Angkor Wat – we were incredibly lucky, because there was no fog. Angkor Wat’s sunrise was absolutely stunning. 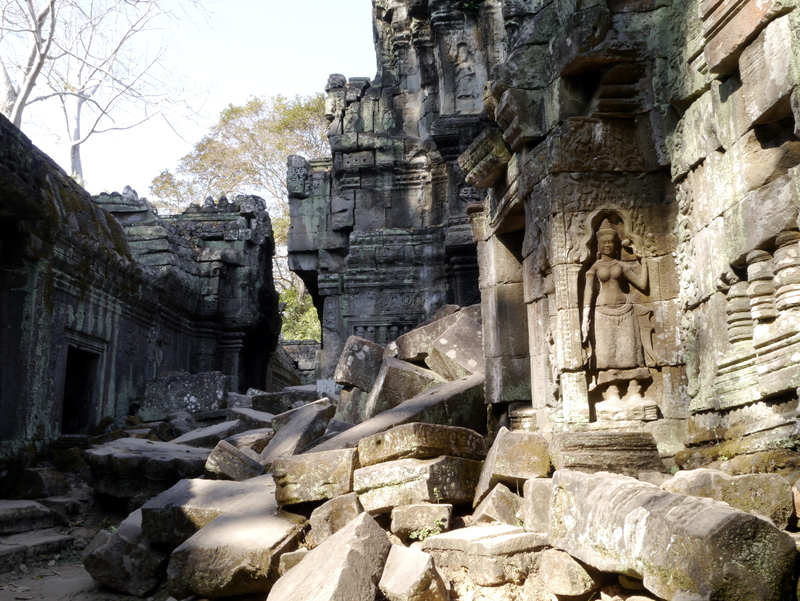 We went on to explore the temple grounds – I loved feeling the cool stone against my bare feet. It was the day before Lunar New Year, so we baibai-ed (offered incense) to Buddha. Before reaching Angkor Wat’s moat, the restaurant owners are already chatting us up to gain our business. They each have catchy names: Jack Sparrow, Lady Gaga, and Rambo (girl) were among my favorites. Matt is a sucker for pirates, so I knew Jack Sparrow would be the eventual winner. 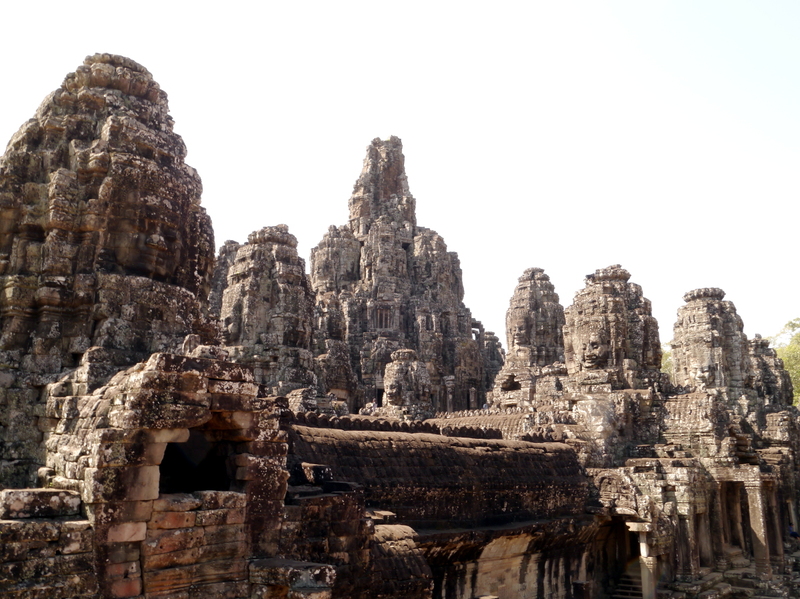 Our final stop in the inner loop would begin at Bayon, my favorite in the 2-day tour. Giant faces ornament the towers in the temple. We walked through a few others before meeting Clem. 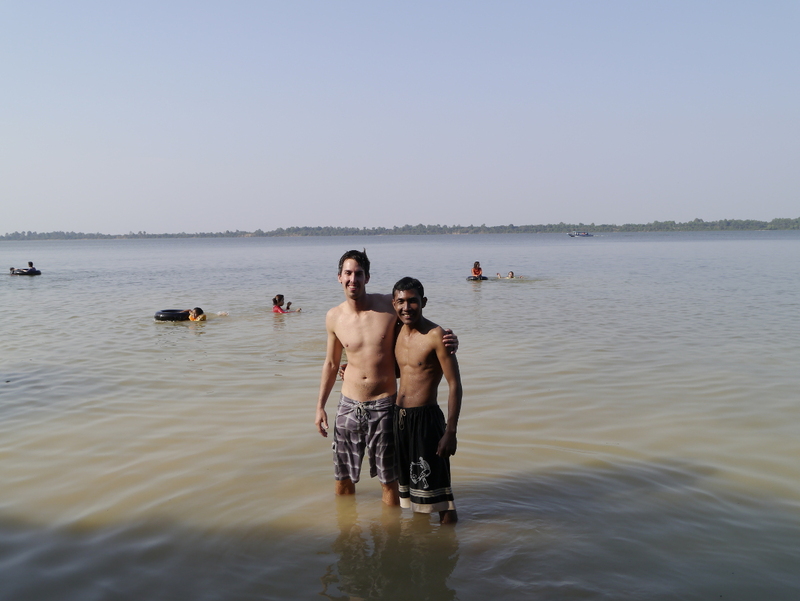 The first day, the girls mentioned taking a side trip for their first lake swim in SE Asia. Early afternoon, we ventured over to West Baray, a local watering hole. There are rows of floor mats surrounded by hammocks for rent. Droves of Cambodian families were enjoying a day at the lake for Lunar New Year, I think we were the only non-Cambodian visitors that day. Crickets, green mangoes, and other delicacies were being sold by women carrying them around on silver trays. Clem brought a cooler of beer to enjoy with his favorite meal – roasted chicken and quail. The day before, Clem revealed that he did not know how to swim. Matt promised to give him a swimming lesson. Clem was paddling around by the end of 20 minutes, not bad! Theresa, Celine and I all decided against going into the water. There weren’t any other tourists there, and the local swimwear is much more conservative than a bikini. The women there plunged in wearing jeans, blouses, and sometimes even a cardigan! We decided to save the bikinis for another time, perhaps when we would be less conspicuous. We drove back to watch sunset on Phnom Bakheng. Sunset was a cluster. With thousands of people fighting to get on top of this hill, it was chaos. When we did finally get to the top, we waited for the sun to make its decent. That said, I thought sunrise was much more spectacular than sunset. After a long day at the temples, we were all beat and ready for a shower. LNY festivities were underway, and a lot of the locals along with hotel staff, including Clem, were sitting around enjoying a few beers. Most businesses near the hotel were closed, so I was surprised it was actually quieter than I had expected. The next day, we would be off to start the Year of the Horse in Cambodia’s capital, Phnom Penh.